As a person living with the progressive illness of Multiple Sclerosis, I visit my waiting room often. This experience can be stressful and isolating not only for visitors who are patients, but also for visitors who are there in support. In this environment, it’s hard to realise that we are all in it together, going through various intense emotions. We are a part of an extremely diverse community and we have unwillingly joined an exclusive club. I now see this group as a family—my tribe—and I want to connect with each and every one of us. But we pass one another in the waiting room like ships in the night, without realising how much we might have in common. Social norms demand hushed silence in public spaces like the waiting room, but such silence keeps us from understanding the powerful impact of connecting with one another in this exclusive club. When I decided to connect with members of my tribe, the sterility of the waiting room made it nearly impossible. Not many of us seem comfortable speaking to one another, or acknowledging one another at all. I decided to see if I could change this. I am a quadriplegic, and my caregiver helps me navigate using my power wheelchair. One day in the waiting room, she rolled me up to each and every visitor. I furtively made eye contact and asked each person if they would be willing to talk to me. They seemed more than delighted. When they agreed, I asked them… why are you here? Everyone answered, in their own way. One man and I discussed his experience with meditation, and how helpful it was for him to deal with his increasing disability. Another woman talked about her physical pain, and how she dealt with it as a professional constantly having to take time off for doctor’s appointments. One young woman appeared not to be interested in talking, but her family member and caregiver was. I posed a question to those who were willing to continue our conversation: would you want the opportunity to have more conversations in this waiting room? Would you be willing to share what you are going through, and/or be interested in hearing what others have to say? They agreed that they would be interested in connecting with fellow visitors. I lay in bed that night, my mind racing. How can we meet this need? To create an experience in the waiting room that people can choose to engage with, without having to put ourselves out there in the way that I so awkwardly did.. I set out to create an experience where each and every one of us coping with illness could acknowledge one another, breaking the silence. I tried using the Conversation Cards in collaboration with the clinic manager of my own waiting room. Week by week, I returned to collect handfuls of cards. I was so excited to read the responses of those who chose to participate. A glimpse of their unspoken thoughts gave me what I was looking for: a sense of camaraderie. This project centers what is going on for that individual, in that moment, in the waiting room. We aim to acknowledge and have an impact on the struggle of that hour or two.We photographed these submissions and the cards are on rotating display on the waiting room’s TV monitor to spark conversation and encourage more participation. In addition to the visitors’ participation, the clinic manager told me that he has started sharing the cards during morning “huddles” with his staff—the ten minutes they have to regroup before starting their day. While staff typically experience either very positive or very negative feedback, he described these everyday, human responses as a “breath of fresh air” for his staff. The point of interacting in the waiting room isn’t to become best friends with the person sitting next to you. 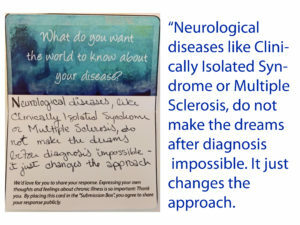 These moments of connection are about acknowledging illness in all its forms, creating new, positive experiences, and offering an alternative to the awkward silences in the clinical setting. There is a sense of pride, or togetherness, when we honor our own thoughts and feelings. And to share these thoughts and feelings in such a vulnerable place as the clinic waiting room is empowering for all. Elizabeth Jameson (@jamesonfineart) is a health policy analyst and an artist who uses neurotechnology, science and art to shift the narrative of chronic illness. Her work is shown worldwide at universities, rehabilitation centers, and neuroscience centers, such as the National Institutes of Health and Harvard University.​ ORCID: 0000-0001-6629-9904. Catherine Monahon is an art educator and project manager who works with individuals, small businesses, and nonprofits to tell their stories through various media. She and Elizabeth write articles together about illness, disability, technology, and art. ​ORCID: 0000-0001-7921-6258. 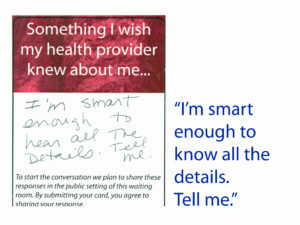 Competing interests: We have installations of this project ongoing at the University of Miami and at UCSF (there is no profit from this), and we are seeking to install the Conversation Cards in other clinics worldwide. Elizabeth delivered a talk at Stanford Medicine X about The Waiting Room Project (at no charge or benefit other than publicizing the idea).